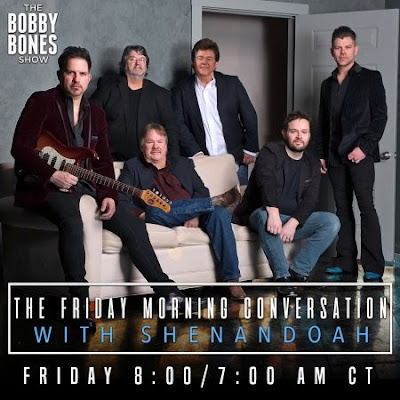 GRAMMY, ACM and CMA Award-winning country band Shenandoah will make their debut on The Bobby Bones Show, tomorrow, April 5 at 7:00 a.m./CT. Founding members Marty Raybon and Mike McGuire will stop by the nationally syndicated iHeartRadio show to chat with Bones and his gang. Topics will include Shenandoah's new album, Reloaded (produced by Jay DeMarcus of Rascal Flatts), the band's 30+ year career, and upcoming tour dates. Additionally, Shenandoah will perform their No. 1 hit tune, "The Church on Cumberland Road." The guys will also premiere their newest single from Reloaded titled "Little Bit of Livin,'" a song that Raybon says will remind fans of their foot-tapping, crowd-favorite tune "Next to You, Next to Me."